My Dell Vostro 3300 died twice today. And by died, I mean randomly turned off in the middle of my work. My thinking is that the laptop is overheating. So, I get this brilliant idea: I'll open her up and clean out the dust that's gumming things up. Dell is even kind enough to provide intricute instructions explaining how to get to the fan and heat sink, which is where I hope to find a whole bunch of dust. Worst of all, I finally do get to the fan, and find that it's not clogged with dust. Ugh. I start the procedure of putting the laptop back together. As I'm just about done, I'm left with one extra part: a tiny ribbon cable used to connect the laptop's media keys to the motherboard. Whatever, I don't use those keys frequently anyway. I just want my laptop back. I plug her in. Hit the power button. Nothing. Hit it again. And again. And again. Nothing. Of course, that tiny ribbon cable not only connects the media buttons, but also the main power switch. Ugh. 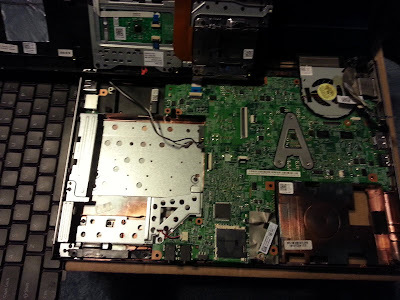 I take the laptop apart again. I ponder how I'm going to connect this wisp of a cable into the keyboard rest and motherboard. I'm still convinced this isn't going to work. Yet it does! And the rest of the pieces go back together, too. I'm thoroughly amazed. I'm actually blogging this story from the laptop that was just in surgery. Lesson learned: leave the hardware to others, and stick with my day job.